The Recruitment Manager template is useful for Recruiters and Managers to manage their recruitment process. It is a handy tool to store jobs and applications received for those jobs. It is designed to make it easy to track progress/status of all the applications or candidates. It has a fully automated dashboard which provides the relevant key metrics to analyze and optimize your recruitment process. All within Microsoft Excel. Easy to Extend. There are only two primary entities to manage (Jobs and Applications). In the JOBS sheet, we will enter each job in a new row with the following information. We enter each application you receive as a new row in the APPLICATIONS sheet. As each application moves forward the different stages in our recruitment process, we track the dates. When we make a decision to hire or not to hire, we update the Application Status and enter Decline Reason where applicable. 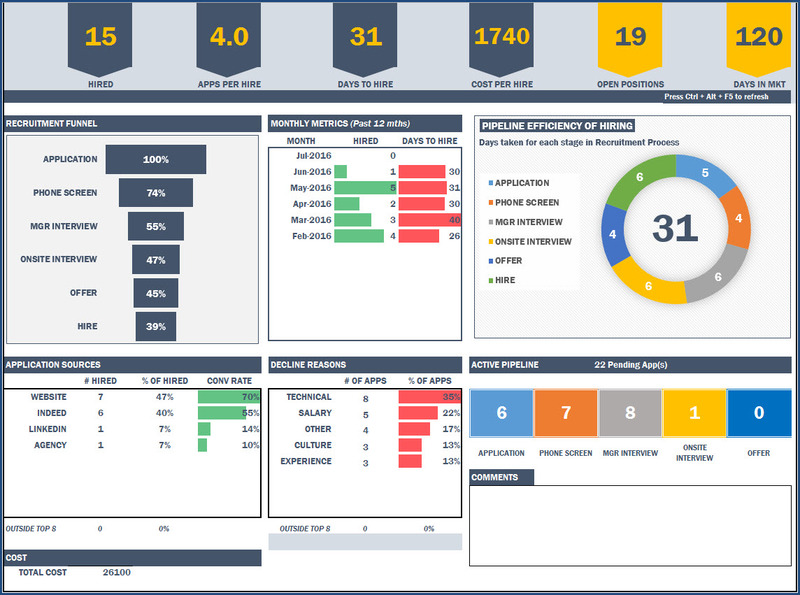 The DASHBOARD sheet presents a single page summary of key performance metrics. Summary Metrics include Hired, Applications per Hire, Days to Hire, Cost Per hire, Open positions and Days in Market (for open positions). 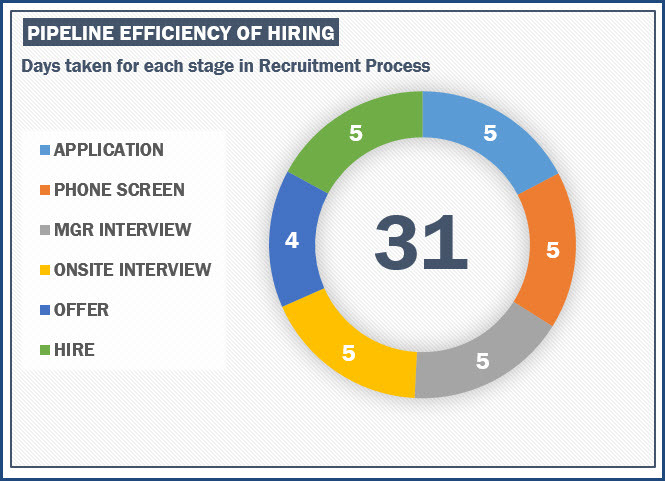 The recruitment funnel indicates how the candidates drop off during our recruiting process in each stage. We can view the metrics (Number Hired and Avg Days to Hire) for the past 12 months. Days taken for each stage is represented and this allows us to identify if there are any bottlenecks in our process which slows down the entire cycle. 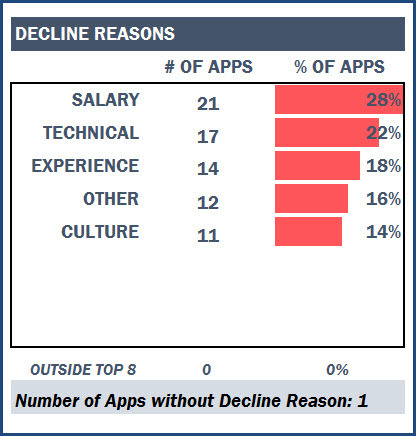 We can see the top 8 application sources that contribute successful candidates to us. Understanding which sources are contributing to hiring (% of Hired) and which ones are the more efficient ones (Conversion Rate) would help direct investment to the correct sources. The template can accommodate 15 application sources in total. 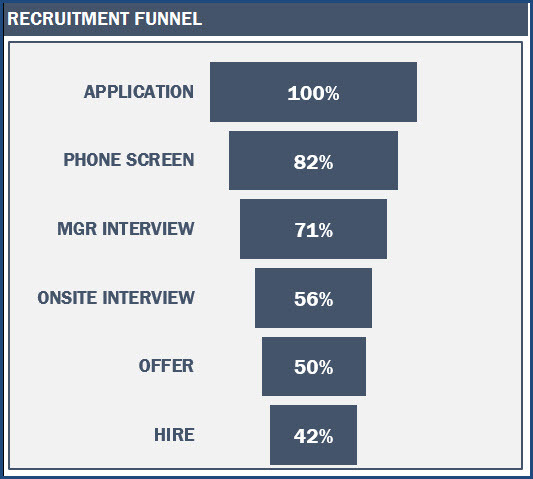 It is always important to understand why candidates did not move forward in the recruitment funnel. This helps the recruiters adjust candidate selections in the future. The template can accommodate 15 decline reasons in total. This provides an overview of the active pipeline – applications that are still going through the process with pending decisions. For example, in the image above, out of the 69 pending applications, 18 are in the Application stage, 21 in the Phone Screen and so on. The dashboard is fully automated. Since it uses pivot tables for calculations, we have to refresh it whenever we added/updated input data on Jobs and Applications. Please refresh it by (DATA ribbon –> Refresh All button) or keyboard shortcut (Ctrl+Alt+F5). The dashboard is very flexible as it allows you to drill down using the filters. There are 10 filters/slicers available to analyze the data in detail and make smarter business decisions. In the Job Report sheet, we can choose a Job ID and view all details for that one job. We can also see the Candidates and comments for each stage. This can be a useful tool to have a meaningful discussion with the stakeholders on the applications and thus take decisions. We can have up to 6 recruitment stages and we can rename them as we need to suit our organization. We can customize up to 15 application sources and 15 decline reasons. In addition to the DASHBOARD, it is easy to retrieve information from this template. The template uses Excel Tables and we can use the standard filter feature. Here are a couple of ways we can filter the data. You can easily identify the jobs that are currently open by filtering on status in the Jobs table (Status = OPEN). To find the list of pending applications, you can use filter similarly on the Applications table ( Application status is blank). For support material on how to use the template, please visit its support page. Reports are too good and very useful.